We’re reaching the dog days of summer, so this is a great time to offer your customers one of our Mood Color Changing Water Bottles. The bottle dramatically changes color when cold drinks are poured in, making it a fun, eye-catching twist on the average branded water bottle. Best of all, it’s made in the USA with safe, durable materials to ensure it lasts through this summer and the next! The Tomahawk Mini Flashlight is multipurpose and designed to be tucked into a car’s glove compartment. Along with a bright light, it has an emergency seat-belt cutter and glass breaker. Your logo is engraved into the housing so it won’t be rubbed off after years of use. Associate your brand with safety and reliability! Bumps and scrapes come with the territory when adventuring outdoors, so your clients will appreciate this first aid kit. It comes with a selection of bandage sizes as well as antiseptic towelettes and first aid creams. Your logo is showcased on the outside of the compact zippered pouch. For customers who enjoy refreshment while outdoors, this camo patterned 12-pack cooler is a great way to show how you appreciate their business. It features an insulated PEVA lining and two outside pockets. This cooler is perfect for a tailgate, camping trip, leisurely hikes, and just about any outdoor activity you can think of! 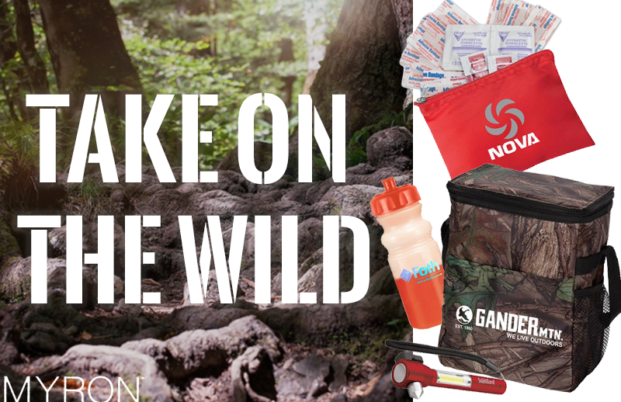 Let your brand adventure into nature this summer with any of our quality, useful outdoor promotional products at Myron. With a 100% satisfaction guarantee, Myron ensures your brand will trek to the top!